In the comfort of my study, surrounded by books, papers, desk lamp and other familiar items, the above title seems extreme even to me. But once I enter the real world, surrounded by blooming plants, buzzing, biting, crawling, flying insects, and blazing, hot sunlight, then the struggle for resources, and ultimately survival, reminds me that the natural world is extreme in most matters pertaining to life. Enter the Brown Marmorated Stink Bug, known hereafter as BMSB. Scientific name, Halyomorpha halys, this Asian import entered this country probably sometime in the 1990s. First sighting reports in 1998 place it in Allentown, PA, a possible stowaway in containers shipped from Asia. By 2004, it was found in a student’s insect collection in central Virginia. My wife and I first took notice of it in 2006, finding it to be an invader into my Mother’s home in northwest Roanoke. That sighting occurred during the Winter and by Summer, 2006. I found them in great numbers on my sweet corn in my southwest county backyard garden. Most ears had 5-15 bugs each, but I could detect no visible damage that they were inflicting. They were just there; harvest revealed their true intentions. Every ear in the patch was destroyed. No evidence on the exterior, but shucking revealed brown, shrunken kernels where plump, bright yellow kernels should have been. Crop: total loss, inedible. The following Summer, after fighting them in interior buildings during the previous Fall and Winter, our black heirloom tomatoes fell prey to the “gang-banging” approach to feeding that the BMSBs employ. Another crop, another total loss. Now, they had my full attention and since then, they and we have waged constant war for the resources that we call food crops (our sustenance and the source of our income) and what the BMSBs consider theirs for the taking. These insects are polyphagous, meaning they feed on several different kinds (species or families) of plants. We (my wife and I at The Professor’s Garden) have suffered significant damage/loss after relentless summer attacks on tomatoes, peppers (sweet and hot), green beans, lima beans, black-eye peas, eggplant, sweet and popcorn, green peas, cucumbers, and figs. They inhabit, in enormous numbers, all the trees that surround our property. These include Leyland Cypress, Tulip Poplar, apple, Carpathian nut, Princess Tree, and plums. Butterfly bushes (Buddleia spp), which line our property, are some of their favorite places of residence. We are educating ourselves, learning who this invader is, his lifestyle, his native foes, etc. This knowledge may allow us to fight it more effectively. Yet, our personal experience informs us that, barring some unforeseen natural intervention, we will have to learn to live with this invader for years to come. And this is what we hope to convey in this message to you other farmers and gardeners, both organic and conventional, in the most serious language we can use. A recent meeting in June, 2010, at the Appalachian Fruit Research Station in Kearneysville, WV attracted researchers and growers from many of the Northeastern and Mid-Atlantic states. This meeting was devoted entirely to the BMSB. In the report, I witnessed real concern, not just speculation, that this pest is now, and will be in the future, a very serious agricultural pest. 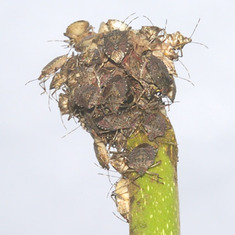 At The Professor’s Garden, our firsthand knowledge of this pest, after four years of its relentless attack, causes us to concur with the group’s findings. We would go further, however. Reports from local conventional farmers indicate that even the use of Lannate and Sevin (Carbaryl) did not prevent significant damage to peach crops. I fear, and suspect, that the use of these pesticides will be completely ineffective within five years since significant subpopulations of these pests must be surviving. Evolution is very real in the world of agricultural pest management. That being said, we predict that the BMSB will be the most destructive pest that American agriculture has yet to encounter. Several years ago, we discovered that a mix of organically approved Pyrethrin and insecticidal soap would kill the adults. David theorized that the soap works as a sticker helping to break down their armour giving the Pyrethrin more time to work.